Join us for an annual tradition! Notes: Scarf pickup available before we march, beer is served on 8th St. and at Bockfest Hall at the end of the march. Cincinnati celebrates the coming of spring every year with an annual party known as Bockfest. In addition to the coming of spring we are also celebrating the neighborhood of Over-the-Rhine and bock beer. Bock beer was traditionally brewed by monks in the winter. It was generally the first lager-style beer available in the new year, and the timing of this beer often lines up perfectly with the Lenten season. Monks would fast during Lent, but there was one important thing that wasn’t forbidden during this time: beer. Bock beer is relatively high in essential nutrients, which was important for the fasting monks. However, the bock beer is also higher in alcohol content. Bock beers average around 8% alcohol compared to the typical 4-6% of most other lager beers. Although the word “bock” means “goat” in German, the origin of bock beers actually has nothing to do with real goats. The beer is believed to originate from the German town of Einbeck (which sounds a lot like "a goat") before being exported across the country and around the world. Combining the fasting with a purely liquid diet of high-alcohol beer is a dangerous combination, and led to many stories about how bock beer “actually” got its name. One such story involves two monks sitting around during Lent who engaged in a friendly drinking competition. After several beers a monastery goat walks by and startles one of the monks as he’s leaning back in his chair and he falls over. He blames it on the goat, but the other monk turns to him and says it wasn’t that goat that knocked him over, but the "goat" in the beer. 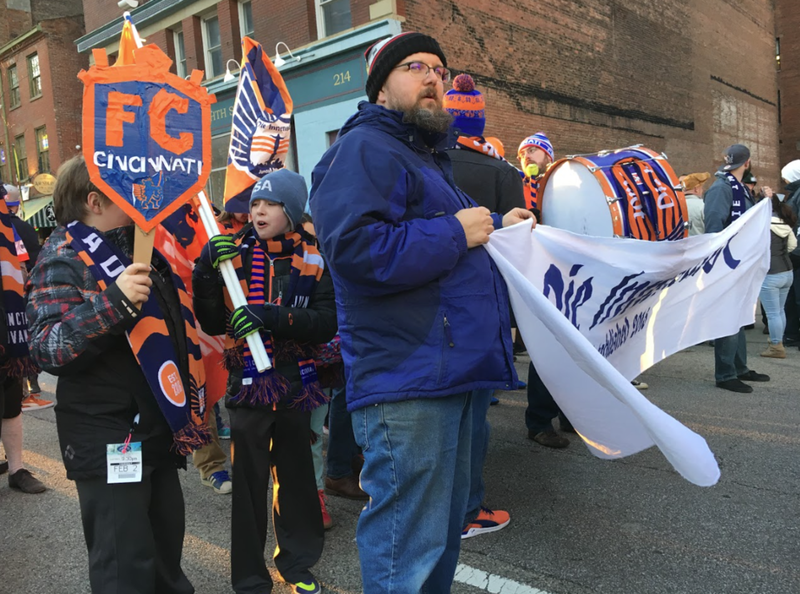 Much like the monks during Lent, Die Innenstadt and FC Cincinnati fans are coming out of a long soccer fast. When the regular season comes around in a few weeks, you don’t want to be the monk that fell over in his chair. We’ll be hitting the ground running with preseason games against the NKU Norse, UC Bearcats, Nashville SC, and Sacramento Republic in addition to our participation in the Bockfest Parade! These events are all within a two-week period, and we need to build up our tolerances before the regular season. Bockfest is the perfect time to do this. The Parade is on Friday, March 2 and kicks off at 6pm. We start staging for the parade at 5pm in front of Arnold’s Bar at 8th & Main in Downtown. The parade goes through Sycamore Street in Downtown and through Main Street in Over-the-Rhine. If you can’t make it in time for the start of the parade, feel free to jump in at any time along the route. This is open to anyone who wants to march with Die Innenstadt. You don’t have to be a member, but you can sign up and you can pick up your scarf before the parade departs! We’ll post our exact location in our Facebook event here once we arrive, but it shouldn’t be hard to find us. Beer is sold on 8th Street and at Bockfest Hall at the end of the parade. For Bockfest Parade info, you can RSVP to our Facebook event page. Please note: Scarf pickup is available at all of these events EXCEPT for the UC Friendly, which we will not have an official pregame for. Beer sales at the Bockfest parade help support the non-profit Over-The-Rhine Brewery District as they build the Brewery Heritage Trail throughout Over-The-Rhine. We hope to see you at the Bockfest Parade as we once again celebrate one of Cincinnati's most unique events!